Today I went for a run along the disused railway line from Burley to Brockenhurst in the New Forest. I wanted this post to be more about how lucky I feel to have such beautiful surroundings on my doorstep so I thought I’d share a few photos I took on my phone. I was always more of a seaside person growing up (and to a large extent I still am) but there is something so magical and rural about the forest. I can’t wait for it to be Autumn again as I know it’s going to be even more amazing when the leaves start turning and there’s a bit more of a chill in the air to cool me down! Today I ran just over four miles – I had to walk for a few paces now and then as my legs weren’t used to running on uneven ground and were quite sore at the beginning. I left in the last picture as it made me chuckle a bit, don’t think I’m going to be winning any 5ks with my 40 minute time! 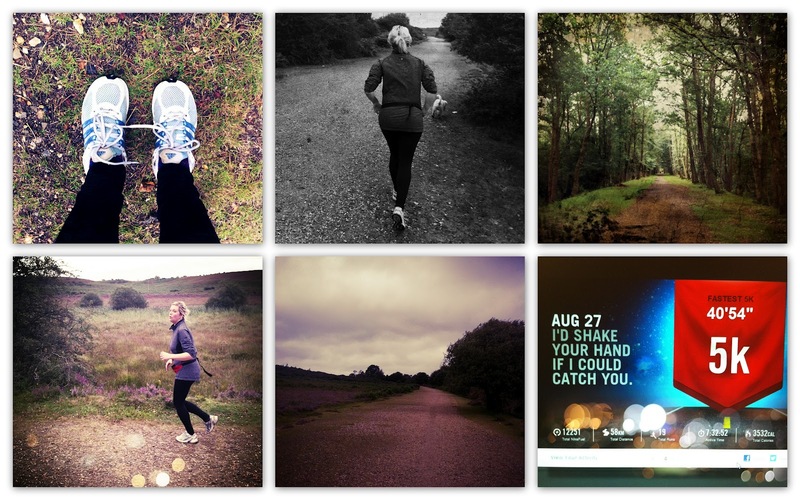 The image is from the Nike website – I run with my iPhone (hence the cool bumbag – cringe!) and use the Nike Running app; it’s absolutely brilliant considering it’s free and records all your times, distances and routes as well as syncing it to the Nike website where you can access more information and set yourself goals. Considering my post a little while ago where I was feeling immensely stressed and pressured I have actually had the most relaxing long weekend ever and it’s done me the absolute world of good. Last week I was on a teaching course (PTTLLS) doing 3-4 hours of coursework a night and feeling anxious about the assessed training session I had to lead but I passed the course, managed to keep my emails back in the office in order and then spent Friday when I got home blitzing the house so it’s now all nice and clean and I just feel calm and on top of everything. I feel like I am definitely more suited to a life of leisure; I could definitely get used to that feeling at the beginning of a few days off where you feel time stretching out in front of you and you know you can just relax and enjoy it. I only have a two day week this week before we head off to End of the Road festival on Thursday and I couldn’t be more excited. I’ve decided I’m going to treat us to some yummy goodies from Abel and Cole before we go – Tom bought a new fridge for the campervan and I can’t think of anything better than shipping off with a fridge full of organic cheeses, bread, meat, juice, and of course, cider! If you have Spotify you can get in the End of the Road folk-y groove with this awesome playlist I found here. How have you all been spending your Bank Holiday weekend? Has it been fun-packed or have you been relaxing like me? * Note about running – Running is a great form of exercise but did you know there has been an increase in sport injuries during the course of 2012? Find out how you can manage injuries caused by exercise and if pain persists you can visit a physio at one of the private hospitals in Sheffield for treatment.